UN Steps Up Efforts to Combat Sexual Harassment Within Its Ranks. The United Nations is implementing new steps to protect its staff from sexual harassment in the workplace and hold perpetrators accountable. "We will not tolerate sexual harassment anytime, anywhere," Secretary-General Antonio Guterres told reporters Friday. "I am well aware of the male-dominated culture that permeates governments, the private sector, international organizations and even areas of civil society." The organization announced the initiative in the wake of a growing international movement to hold accountable perpetrators of sexual misconduct in the workplace. Social media movements including #MeToo and #TimesUp, which started in the film industry and exposed powerful producers, directors and actors, have spread across society. In the process, they have ended the careers of powerful members of the media, politicians and businessmen. The United Nations has not been exempt. The British newspaper The Guardian published a lengthy investigation last month, citing more than a dozen unnamed U.N. staff who said they had been victims of workplace sexual harassment and even sexual assault during the past five years. Several accusers said they were afraid to report the abuses because they feared retribution that would end their U.N. careers. Three of the female accusers interviewed by The Guardian said they had reported sexual harassment or assault and had been forced out of their jobs or threatened with that, while the alleged violators remained employed. Others reported having been discouraged by colleagues or internal watchdogs from pursuing complaints. 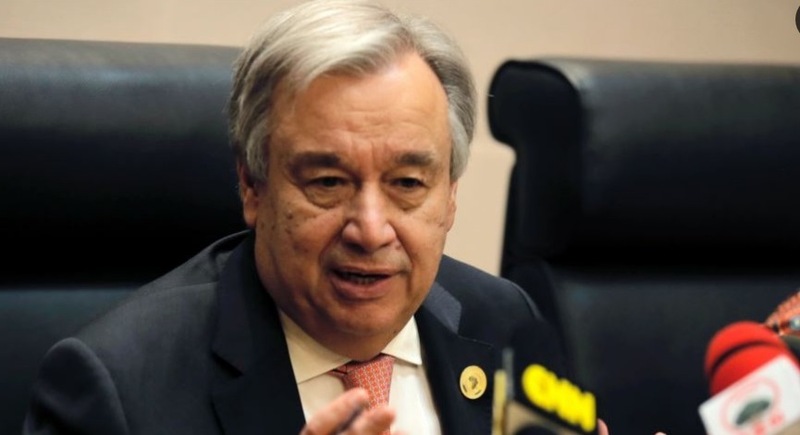 Guterres said the organization would implement five concrete steps to tackle the problem. "We are committed to taking every allegation seriously — past and present," he said. Guterres said a hotline would be operational by midmonth that staff could use to seek confidential advice. He also announced establishment of a new task force to "step up efforts to tackle harassment and boost support for victims," as well as a "rapid response team" to offer guidance, information and services to victims. Guterres said the U.N. would soon carry out a staff survey to get a better grasp on the prevalence of sexual misconduct and reporting rates. The world body also plans to enhance protections for whistle-blowers. The U.N. chief has been a vocal advocate of gender parity in the organization's senior ranks as a major goal of his first year in office and announced recently that women now slightly exceed men in senior posts, 23 to 21. "We will continue to change the dynamic and put greater power into the hands of women to prevent and end sexual harassment and all abuse of power in the U.N.," Guterres added. The U.N. has for years tried to eradicate peacekeeping forces' sexual abuse and exploitation of the civilians they protect, but this is the first time the organization has taken such a public stand on sexual misconduct by its own staff.